I don’t really get what these things are. 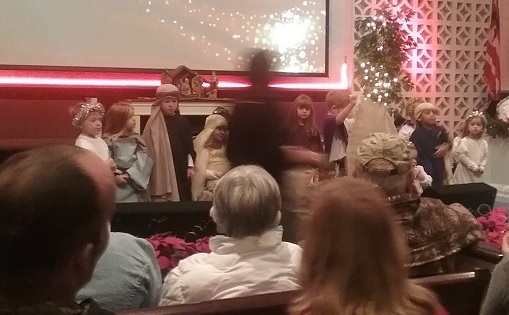 As my wife and I were flipping through some pictures from last Christmas, we saw one of them in a snap we took of the kids’ Christmas play. It looks malevolent enough, but what kind of masochistic creature would willingly watch a bunch of toddlers warble through Christmas songs? I almost wonder if it wasn’t an entity at all, but maybe a projection of us all dying a little inside. Some people claim these things are demons, some say evil aliens, and few think they are the souls of particularly vile humans who refused to pass over to the other side. I’m not sure about that, but we did have a mean-spirited apparition on the farm where I grew up, and we all just sort of accepted it. It could mimic the shape and mannerisms of specific people from behind, but for some reason it couldn’t do their faces. It also had an off-putting habit of knocking a picture of Jesus off the wall every time somebody died. And after doing that, it would drag an old trunk from one end of the room to another. Eventually one of my uncles got drunk and pissed off enough to burn that house down, but the thing just moved over to another old house on the property, and now we’re letting that one rot because no one will live in it, and we’re afraid to knock it down. On the plus side, most of us don’t have to worry about this stuff too much longer. A priest once told me the Catholic Church knows the anti-Christ is real, and he was born during the pontificate of John Paul II. That means this guy is anywhere from 12 years old to 39. He is also supposed to have blue eyes, if that helps.